Disintegration testing is a pharmaceutical method developed to evaluate and ascertain how well (and if at all) a tablet/sample breaks apart in the human body. This test is not to be confused with dissolution, which is the process that immediately follows disintegration. Disintegration tests evaluate how well a sample breaks apart from its manufactured form into smaller, looser, more free flowing structures that are then able to continue to form a solute with the liquid they have broken down in. 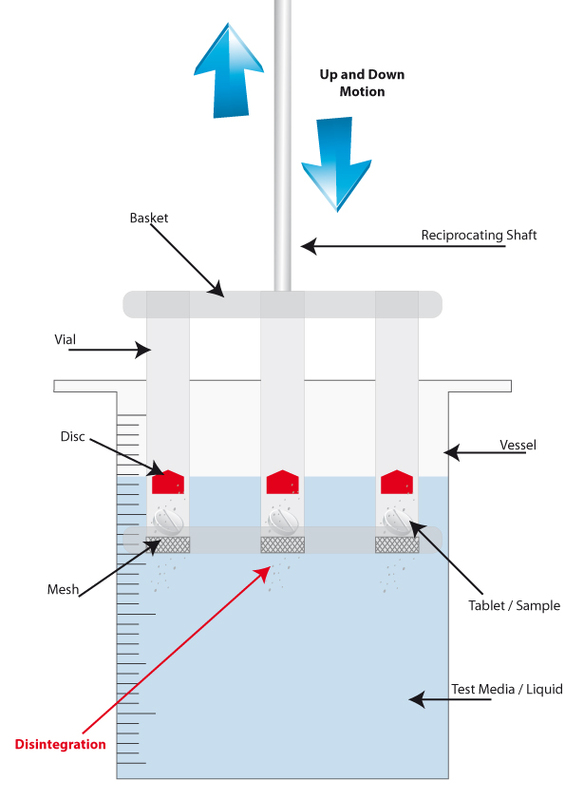 In simplistic terms, the disintegration test measures if the sample crumbles into a powder, or remains as a solid block in tablet form. If a tablet/sample successfully breaks down to a crumbled mixture, then the test is recorded as successful/passed. If, however, the sample does not break down, this is recorded as a failure. For any tablet’s ingredients to be able to combine with the human body and carry out its medicinal effect, it is crucial that they can break down inside the stomach to allow the tablet mixture to form a solute with the body. This act of disintegration is what disintegration testers measure. Pharmaceutical and life science companies utilise disintegration testers to evaluate their products ability to disintegrate and breakdown in Quality Control laboratories, and during research and development of new products. If a sample is found to fail the disintegration test, it will often lead to that particular batch being discontinued or cancelled, or the product being redesigned to achieve the desired crumbling result. Disintegration testers are the machines which carry out the disintegration test. They are often found inside Quality Control laboratories in pharmaceutical and life science organisations. Their primary purpose is to confirm if a tablet/sample can break down from its solid, manufactured form into a loose, free flowing powder. Disintegration testers are built by a variety of different suppliers, but all to the same USP regulations, which govern the uniformity of the testing conditions, so that global compliance and quality standards can be maintained across different companies and manufactures throughout the world. This means the essential components and processes carried out by all disintegration testers is the same. How do Disintegration Testers work? Disintegration testers are comprised of a reciprocating arm that drops in and out of a vessel. This vessel sits inside a heated water bath which mimics the human body temperature. Inside the vessel is the test media, which has a ph. level similar to that of the human stomach. This crates the simulated environment of the human body. Attached to the moving arms of all disintegration testers is a basket. It is here that the tablets/samples are held. Each basket can contain up to 6 tablets, separated into glass vials. There are also 3-vial baskets available for bigger samples. At the bottom of the vials are metal mesh disks, which ultimately provide the crucial evidence that the sample either has, or has not, disintegrated correctly. The tablet/sample is placed inside the vial, on top of the mesh, and a small disc is placed above the tablet to stop it from floating to the surface of the media, keeping the sample submerged. The reciprocating arm raises and lowers the basket in and out of the vessel for fifteen minutes, and during this time the friction of the test media on the sample initiates the disintegration. This movement mimics the flow and friction that would be experienced inside the human body. Once fifteen minutes has accrued, the moving arm is halted and raised out of the vessel for inspection. If there is residue left on the mesh, the test has failed. If there is no residue present, then the test is recorded as a pass. If there is no residue on the mesh disk, then it means the sample has crumbled into a powder and fallen through the mesh, confirming a successful disintegration. USP regulations stipulate that all samples must disintegrate in under 15 minutes. 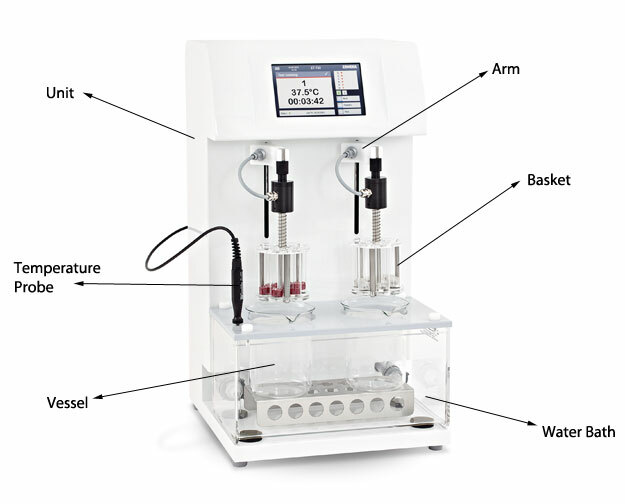 The USP also specifies the mechanical requirements of all disintegration testers, including the speed of the moving arm, the dimensions of the basket, the size of the vials and mesh, and the ph. level of the test media and water tank temperature.